His call name is "Max". His immediate ancestors hail from Germany, where the German Shepherd Dog originated and is still bred best. He lives on a ranch in the stunning southwestern region of NM, near the town of Magdalena, just west of Socorro. His kingdom consists of vast acreage to oversee, beautiful vistas to admire, and a pack of seven, including sons and daughters from his mate, Catey. He is Hunter's father, and it's quite obvious that my wonderful young "acorn" didn't fall far from this strong and magnificent "tree". 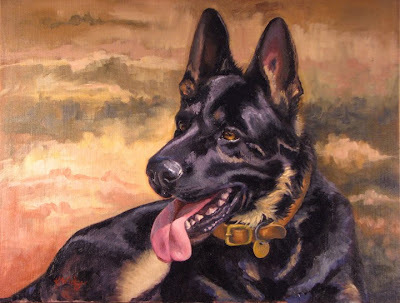 I painted Max on commission from his owners, Bill and Sherry, who obviously adore this handsome fellow. It's on their gate that I first saw the sign, along with the image of a German Shepherd Dog, warning potential trespassers: "I can get to the gate in 3 seconds: Can you?" Having met Max and spent some time with him, I can attest to the fact that, yes, he can, and no, you don't want to challenge him to a race to the gate! No better companion, protector and watch dog could ever be found! Max, you sweetheart, thanks so much for the fantastic genes you passed on to my Hunter! Today is the 4th anniversary of the death of Mychal Angelo, my beautiful Standard Poodle. It also marks the first anniversary of his death that I have felt "whole" again. There is still, indeed, a big hole in my heart, but healing has taken place this past year and I am, along with my pack of four wonderful dogs, in a "good place", now. Since Mychal has left us, owls have become a part of our life, in many ways, offering omens, strange visitations and encounters both physical and in the realm of dreams. This morning, when Ken went out to do the chores, he discovered a young male owl in the hen house. He had killed and partially consumed a hen (ironically, one that was not doing well and Ken had planned on dispatching today or tomorrow). The two roosters, Rudy and Ralph, had him cornered and kept him from leaving the hen house after his dinner. Ken ushered him out, expecting that he'd immediately fly away. But, instead, he ran over to the fence and climbed up to this post. Ken came in and got me and the camera. After a bit, he tried to fly away, but couldn't. His right wing was injured, probably in the altercation with the roosters in the hen house. Ravens began circling, and within what seemed like mere seconds, the sky was full of them, diving on him, full of murderous intent. Ken ran and got a dog carrier and some welding gloves, but we were amazed as the owl almost walked into the carrier without much fuss. It seemed he preferred the safety of the carrier to the impending rendevous with the ravens. A few phone calls later, we drove him into town to meet a rep from the Wildlife Rescue group. He'll get some attention today, and when he's ready, they'll bring him back out here to release. We don't begrudge him his dinner; the little chicken was the weakest of our flock and hen-pecked to the point her life was pretty miserable. As Nature intended, that is the hen the owl took. And besides, it's up to us to provide protection for our chickens; we failed to close the chicken door; he merely walked in and ordered up his "chicken in the box" dinner! We're both very relieved that he wasn't seriously hurt and hope that he'll be back in his home territory soon. Mychal calls to me once again: life goes on, all is as is should be, God's providence assures soft landings in hard places.